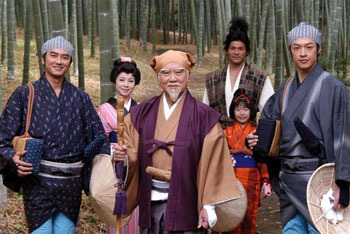 With over 1000 episodes aired, Mito Komon is currently the longest running Japanese TV drama in history. The main character, Mito Mitsukuni, is based on Tokugawa Mitsukuni, one of Tokugawa Ieyasu's grandsons (son of Tokugawa Yorifusa) and lord of the province of Mito (now Ibaraki prefecture). Born in 1628, he was a scholarly recluse best known for researching the Dai-Nihonshi, a history of ancient Japan. Late in his life, he adopted the literary name "Komon" (Yellow Gate). The stories are based on popular legends about his incognito rovings around Ibaraki. Of course, in the series, he also puts right any wrongs wherever he finds them. The plots are basically the same. Accompanied by his faithful attendants, servants and ninja, Mito Komon wanders around the countryside, helping those he finds oppressed by corrupt officials or evil landowners. A violent struggle typically ensures near the end of each episode, at which point one of his attendants flashes Komon's inro, a lacquered case bearing the Tokugawa crest, thus revealing his true identity and proclaiming, "Here before you is Lord Mitsukuni of Mito, uncle of the Shogun." Realizing they are facing someone who wields incredible power, the evil doers drop to their knees and grovel. Suppressing their rage as being outdone, the episode ends with Mito Komon always putting everything right once again and then continuing on his journey. NOTE: The episodes weren't numbered. Fans attempted to number the episodes, but the numbers differ between collections. Therefore, it is impossible to indicate which episode a particular cast member made an appearance. Also, there were literally thousands of guests appearing throughout the years. As a result, the cast listing consists of artistes who are considered regulars. This page was last edited on 21 December 2018, at 04:00.